You are here: Home ∼ 2012 ∼ September ∼ Auto, Sangam cinema Chaloge? It has now been a little over a month that I have moved into my new house, and completely love it. The weekends are fun, the view from the 10th floor balcony is just stunning. In a very unscheduled manner, the rains got delayed to September and it was raining all day in the beginning of this month. Surprisingly, by a strange act of God, it has not rained a single drop after the Ganesh Pandals have been up from last week. Even the rains God are here to appease the Lord! Now, Coming back to my house, the weekends are beautiful and relaxing due to the scenic view and I just keep lazing in my balcony all day along absorbing it as much as possible. Then comes Monday, and it is still raining. The view is still the same, but I now have to go to office, and the pain point here is the going part. The fact that it takes time is still bearable; the irritating part is waiting for a rick for the ride. And then, further more irritating is the part where I have to convince the driver to take me there. I am paying him, and customer is King is all good in text books, but not with the autowallahs! Every morning, it has become a daily to chore to walk down the road, and keep asking every possible auto guy, “ Sangam Cinema chaloge?”. One auto, after another rejects you, and you just keep walking, hoping and waiting for a kind soul who can give you the ride. Sheer utterance of the word,” Sangam Cinema” repels them and generates the expression of disdain. Is it a strike today? No! it cannot be happening every day. Is the auto already engaged? No, it is only the driver riding away to his glory, and him slowing down and listening to your destination gives an impression that he is out to do his job. “Kyun? Phir kahan jaana hai? Jahan aapko chalna hai, wahin le chalo!” I tend to fight. In vain, after a brief hiatus, I had to get down the auto as he refused to budge, and I was getting late for office. So, feeling like a solider returning from a lost battle, I again start my tryst with the next empty auto guy! This is a routine that keeps repeating day in day out, twice a day, every day. Morning and evening. And inadvertently, the auto driver always seem to have a different way to go than you destination. This makes me think, why? He is there to provide a service, and I am here to pay and use that service. Perfect economic sense right? So why this situation?Assuming rationality, the only reason is, the auto Rickshaw driver does not see financial sense to give you a ride, and counts on getting a better ride (to maybe a longer distance with no traffic on the way). He is okay to go into the direction of uncertainty as the upside is too high probably. By the way, Auto rickshaw meters in Mumbai run even when the auto is stationery (like being stuck in traffic). Clearly, the tariff for the waiting period is not too high to incentivize the driver to take the traffic route. One other key reason is the demand – supply gap during peak hours. In the mornings, and the evenings, there is a splurge of office goers and the number of autos on the road remains constant shifting the equation. How can we tackle these issues? 1. Let the market decide the Auto fares and fix it, rather than regulate the fares. To avoid monopolistic behavior we can have a couple of auto unions in every area who would decide on the prices. Maybe a model like branded providers for cool cabs can be created for autos too. This would help avoid cartelization of the unions as each of them would be competing with the other for the passenger. Alongside, other forms of public transport like bus, metro, Cool Cabs, etc to give the passenger a wider variety at different price points. Passengers who can wait for the peak hours to subside would wait, as they now have an incentive of lower pricing. Also, during peak hours the autos would realize the benefit of carrying a passenger more than roaming around empty in hope of getting a better longer distance ride. Autos would have the single minded focus to maximize the number of rides during these peak hours. 3. Develop the concept of Share Autos. More often than not there is more than one person willing to go to the same destination, and sharing an auto by both could divide the burden on them and on the road traffic too. 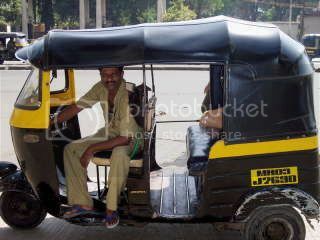 Even the Auto Drivers get to gain by charging a slight premium. An efficient Public transport is the first step towards a truly global city. And if Mumbai aspires to get anywhere close to that status, Public transport is the first step in that direction. jis din 1/2 hr tak barish ho gai us din na auto jainge ,na taxis, n local trains wd get cancelled ! and on top of it ..there wd l b jam on road ..in mumbai !